Do you have something covering your window well? Unfortunately, window wells can be dangerous when they don’t have a cover. Small children and pets might accidently find their way at the bottom of the window well. To avoid any falling injuries, make sure you have something sturdy and virtually unbreakable on top! Keeping a window well open also invites debris to accumulate and clog the wells water drain. This can cause damage to your home, and you don’t want that! Having a cover over the window well keeps unwanted debris out! We have plenty options when it comes to window well covers, find out which options works better for your home. 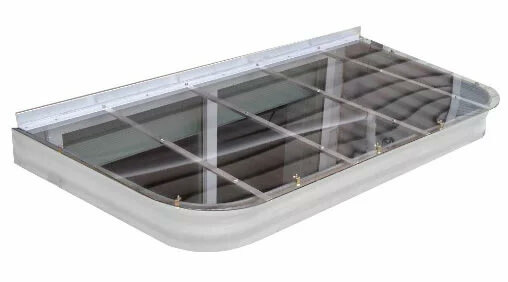 Polycarbonate window well covers are the crystal clear ones! We use the material polycarbonate because of the durability, unlike the easily breakable plastic you find at the hardware store. The strength of these clear covers are incredible, they hold up to 400 pounds and are made to have a long life! We are very proud to say that these covers are made in the USA. Something you may be wondering is how do the covers stand up to the harsh rays of the sun? On the covers there is a UV film to protect it from turning that ugly yellowish color. Your window well cover will stay crystal clear! Getting as much natural light as you can in your basement is important! The great thing about these covers are that they let the gorgeous sun shine through seamlessly. No matter what the style of your house is, we have the perfect window well cover to match it! They are made to fit your window well’s exact dimensions. We designed the sloped shape to keep water moving downward. This makes sure debris will move towards the ground instead of staying on the window well cover. Some basement windows extend past where the window well stops. No problem! We have a bubble window well cover for those types of situations. These are also resistant to heat and cold. Looking for a more modern sleek design? That’s where the atrium style comes in. Many people love the style of this and purchase it for that reason! These are perfect if you have a casement or crank-out window. The atrium does not easily shatter, it can withstand a sledgehammer! Some of our other options in the crystal clear cover category are molded, square, flat, dome, and semi-circle. Window well grates are another great option! 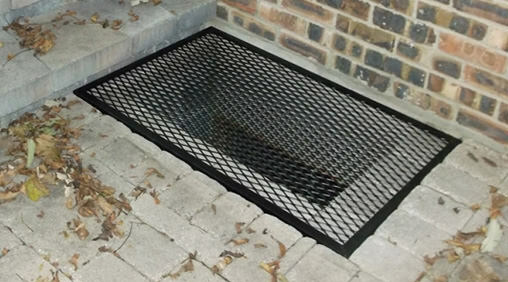 These grates allow for fresh air to reach your basement. Instead of being made out of steel that can rust, we make them out of aluminum which is rust-free! This leaves you with no worries about rust causing any damage to the window well grate. These also hold up to 400 pounds making it durable and sturdy! No matter what the dimensions are to your window well, we customize them to fit your well perfectly. The safety of you and your family is extremely important to us. The grates are also light weight and easy to remove in the case of an emergency. Are you really picky when it comes to the color? If so, the window well grate will be great for you! We can customize the color with a powder-coat! If you don’t like the fact that the window well grate is open to the elements, we have a clear top cover for the grate. They fit right over our aluminum grate and protect it from weather and debris. They are made out of the same material the window well covers are made out of, which makes them incredibly strong!